The catalogue King is relinquishing its paper crown for click and collect. Retailers are rolling out ‘click and collect’ as if their very existence depended on it in a frantic rush to cash in on the latest shopping trend this Christmas. First Royal Mail announced a tie-up with Amazon this morning, and then Argos opened its first ever London Underground store. ‘Store’ is a somewhat generous term, given that the outlet at Cannon Street tube station will have just 170 square feet of sales space - ‘roughly the size of a large kitchen in a typical family home’ and the retailer’s smallest ever shop. 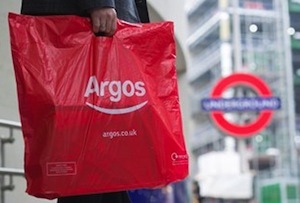 It’s just one of many experiments Argos is undertaking as it tries to consign the catalogue to the annals of history and rebrand itself as a ‘leading digital retailer’. Other ‘digital formats’ include replacing catalogues with tablets, opening smaller stores and trialling concessions inside sister chain Homebase. The company, owned by Home Retail Group, isn’t the only one to be lusting after TfL’s underused space, which the quango estimates will bring in revenue of £3.4bn over the next 10 years. Amazon is also setting up lockers in stations, while most of the big supermarkets are installing collection points. Other retailers may need to get in fast or they could risk missing the train.